Editor’s Note: The article below is based on an experience had by the author. As the Almadraba is a traditional practice by the Andalucians, we felt that it was very poignant article to place on Catavino. However, we want to be very clear that we understand the controversial nature of the catching Bluefin tuna considering its current status as an endangered species. Hence, at the end of the article, we have provided several links to websites and films for you to further your own research. Additionally, we welcome your knowledge and feedback. Please add them to the comments below. The author, Anne Manson, ran her own catering and corporate hospitality company in London for fifteen years before deciding to head for Vejer. Her love of Spanish food, wine, Sherry, music and culture led her to the fabulous diversity of Andalucia where she hosts cooking and wine events in her home overlooking the sea. Last week – I saw it happen. I watched as the majestic blue-fin tuna, glistening in the morning sunlight, being hoisted out of the sea to begin their journey from Zahara de los Atunes to dining tables in Japan. In a small boat of just 10 people, I was with Ignacio Soto of Nature Tarifa, who was granted the first-ever license to take visitors out to watch the levantá (raising of the trap) of the blue-fin tuna, as practised by fishermen using the ancient almadraba system. 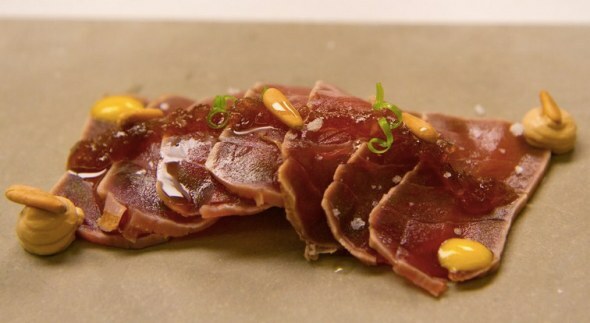 Known as atun rojo (red tuna, thunnus thynnus) here in Spain, it is highly prized – if you’ve ever tasted its sweet, tender flesh you’ll know why. The Japanese can’t get enough of it to make sushi/sashimi, which is why about 80% of tuna caught off these shores is exported. Before heading into the warmer Mediterranean to spawn in May, the blue-fin tuna spend the winter in the depths of the Atlantic and build up blubber to keep warm. This extra layer of fat is why the tuna melts in your mouth like butter. Every year in May, after the first full moon, fishermen from four towns near Vejer – Barbate, Zahara, Conil and Tarifa – set up a complicated labyrinth of nets off the Atlantic coast. Invented by the Phoenicians 3000 years ago, the almadraba is an ingenious system positioned in the exact part of the sea where the tuna pass on their way to Mediterranean, as they migrate to warmer water. The fish swim through different parts of the nets until they’re caught in a central area, surrounded by the boats; the net is then lifted and the largest specimens are selected by the expert fishermen – they can weigh more than 500kg. The almadraba is a perfect example of sustainable fishing – only the tuna are caught, and only the biggest of them are kept; the others are returned to the ocean. There is no waste, and no over-fishing – the fishermen know exactly which specimens they want, there’s a strict quota, and it’s not in their interests to take more. Having watched the impressive co-ordination of the pescadores on Friday, it struck me how much easier it would be just to scoop them all up with a huge net, rather than taking out individual specimens. But that would go against the tradition of this area, and one of the many aspects of life in Andalucia that I’ve learnt to respect is tradition – it is key to existence here. Thinking back, before I bought my white house perched high up in the pueblo blanco of Vejer de la Frontera, I’d never heard of the almadraba. And when I did eventually become aware of the excitement stirred up every May by the arrival of deep, dark-red slabs of tuna, proudly displayed on the marble at Manoli’s Pescaderia, the whole almadraba event became a bit of a fascination for me. Until I was in my late 20s, I’d never even seen or tasted fresh tuna. In Aberdeenshire, where I grew up, tuna was the domain of John West. It was surely a prized product, because each green tin contained juicy flakes of tuna that Mr West hadn’t rejected!! I’m pretty sure I thought it came from Canada – or did I even think about how this fish had ended up in my sandwich? At university I used to mix it with boiled white rice, tinned sweetcorn, soy sauce and toasted flaked almonds (obviously a gourmand in the making!) I remember my first taste of fresh tuna, at a restaurant in NYC in the late 80s. The pinkish-grey slice had been encased in crushed peppercorns and seared. I was blown away by its amazing flavour. And today, I was blown away by how simple, and perfectly executed, the execution of these regal fish was. 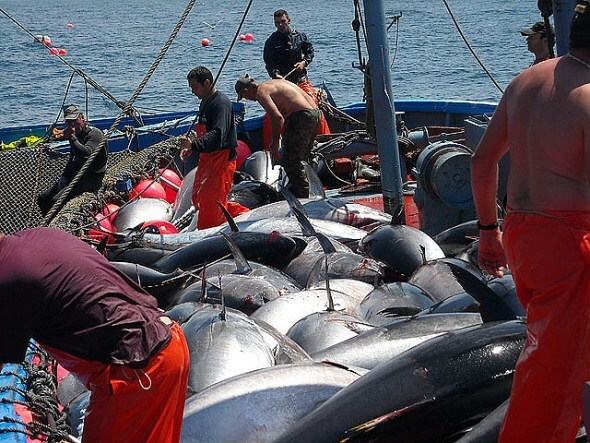 I’m neither protesting nor objecting, but while the sight of tuna being caught by 40 Andalucian men was undeniably impressive, it seemed terribly sad that the bulk of the tuna were going to be butchered and preserved at -60 degrees for their journey to Japan. The gallant trabajadores of the boats probably can’t even afford to eat the atun rojo that have ducked and dived past their shores since Phoenician times. Globalisation has turned the world’s attention towards this fabulous product,that is in such demand internationally. Until relatively recently, it was simply the mainstay of the families in these Cadiz fishing villages. There doesn’t appear to be a shortage of atun rojo in the markets here – it’s the price which is so prohibitive: €24 per kilo for the basic cuts, rising up to €38 per kilo for the prized barriga (belly). Interestingly, I recently returned from Sicily, where the atun rojo was sold in the markets for €16 per kilo. Perhaps not as sought-after once it has swam all the way to Sicily, thereby reducing its prized body fat. So now, the people of Barbate are left to enjoy cans of tuna from Lidl, whilst they can only watch out of their windows as the tuna are lifted from the waters that were once free to be fished by their forefathers. A similar thing has happened to quinoa, a protein-rich grain from South America. Once the mainstay of Andean people, since before the time of the Incas, it is now the darling of the culinary adventurer, and has become unaffordable to the people who farm and live there. These days they are reduced to pizzas, whilst their indigenous crop heads to the gourmet shelf of your local supermarket. 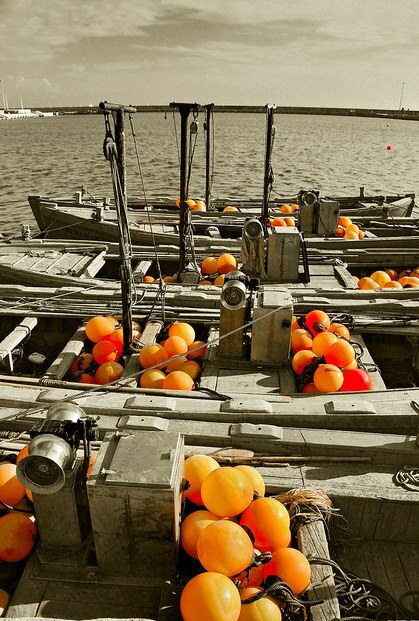 Once the catch was heading off to the processing plant at Barbate the remaining men and boats reset the almadraba trap for the next day – and it was all over. As if nothing had happened. Following 20 minutes of ferocious splashing by the huge fish, the sea returned to its rolling calm, Ignacio turned our boat around, and we too sped back into harbour. I felt an overwhelming feeling of loss – wondering if the magic of the atun rojo and the almadraba had left me. Contact Catavino if you’re interested in exploring the gourmet treasures of Andalucia via a tour or cooking classes!